St. EADman Belgian Dark Ale is part of the Flying Dog Brew House Rarities series, and I believe the first one to be bottled. Frankly, I am not sure how the oddly capitalized name is meant to be pronounced. 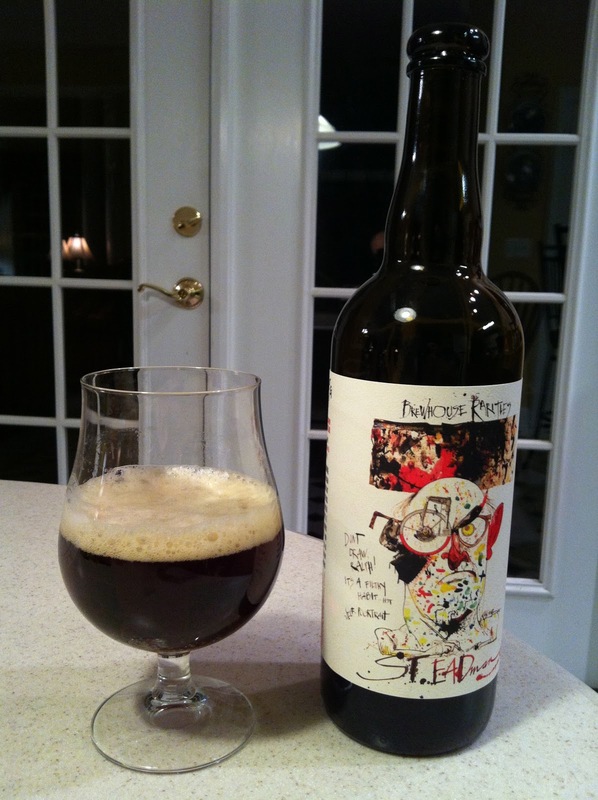 The bottle conditioned beer is named in honor of Ralph Steadman, the artist behind the brewery's edgy labels. The St. EADman label features a self-portrait of the artist. Colleen and I shared the bottle with a guest on a recent evening. Even split three-ways, at 10% AB, the 750 ml bottle sufficed for all three of us during our late evening tasting. However our friend did remark, "Do you have any more like this?" St. EADman pours a very dark, chocolate brown with a frothy and persistent beige head. The aroma is predominately dark fruit, raisins, with a hint of sweet cherry. The flavor has a mild sweetness with dark toffee and caramel. Hints of dark cherry, figs, raisons are some of the fruits that come in to play as well. The mouthfeel is creamy and slightly acidic in the finish. The alcohol is well-hidden, with just a bit of warmth showing up at the end. Overall a very enjoyable, but not overly complex libation. I received this review bottle from the brewery late last year. I put it in the cellar and forgot about it until this week. That's too bad, as I would have liked to gotten more. It was a one-time brew, released in the mid-Atlantic area in November 2012. If you see any around, be sure to pick it up. Note: This beer was provided by the brewery. It is through my own free will that I consumed and reviewed it. No compensation was received for this review.